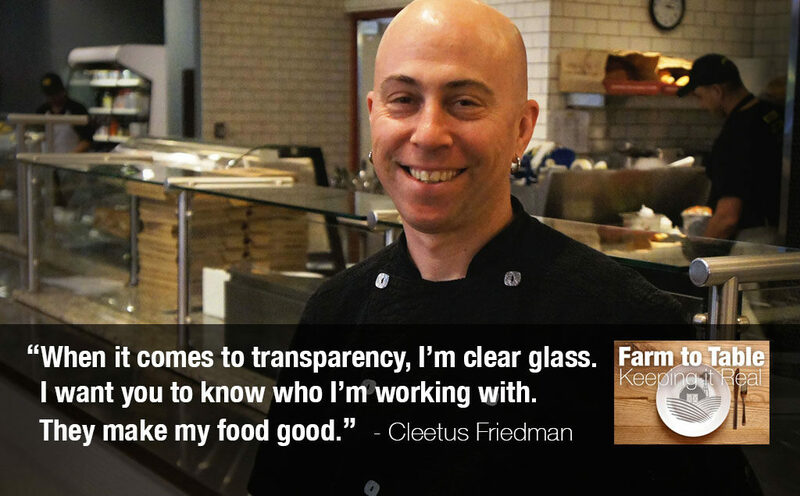 Cleetus Friedman is the executive chef of catering and events and creative chef for all four restaurants in Chicago’s Caffè Baci group. He began his food journey busing tables in his native Baltimore about 30 years ago, when he was in his teens. Yet the road leading to his place at the cutting edge of the local and sustainable food movement had some twists and turns. He studied Japanese in college but — prompted by the early death of his father from a rare disease — he decided to move to Chicago to chase his passions. Initially those involved improvisational comedy and performance art. But he also kept working in kitchens and, after deciding to do that full-time, he became a pioneer of the farm to table concept in Chicago — developing relationships with farmers, holding farm dinners, and working with the growing sector of craft brewers to design culinary recipes for beer. He expressed his Good Food devotion at City Provisions, a deli on the North Side that featured sustainability, seasonality and ingredients that were hand-cut or hand-made. 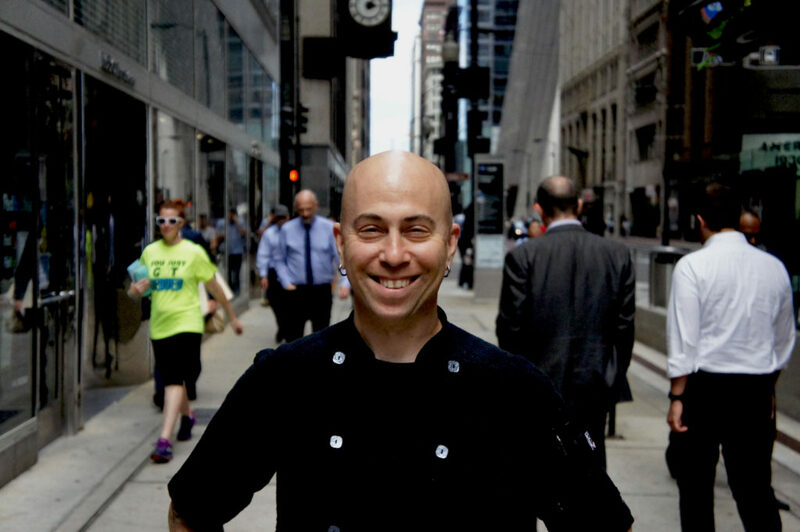 City Provisions made an impact on the Chicago scene despite a short life span, and Friedman has continued to adapt his principles in larger settings. His first stop was as executive chef at Fountainhead, not far from the City Provisions location, which had previously been much better known for its whiskey and craft beer selections. Then, earlier this year, he surprised the Chicago food scene by moving downtown to take over the menus at Caffè Baci’s four restaurants and catering business. Friedman faces the challenge of putting his personal stamp on the menu and bringing in more local, sustainable ingredients without alienating the clientele of the popular 24-year-old restaurant group. But Friedman says this is necessary to keep the Caffè Baci concept fresh and address the growing competition in the food space in Chicago’s Loop. July 14: 225 at 5, a monthly happy hour at Caffè Baci’s 225 W. Wacker location, featuring two leading Chicago craft beverage producers, Few Spirits and Half Acre beer company. July 15: CigarBQue, an annual food-spirits-cigars event at Beyond Design at 4515 North Ravenswood. And Friedman is returning to Baltimore for two nights — July 22 and 23 — to do a menu takeover at Artifact Coffee with Spike Gjerde, the James Beard Award-winning chef of that city’s Woodbury Kitchen. The following is an excerpted interview with Friedman focused on his career and devotion to Good Food. FamilyFarmed: Please give some background about how you got to this place. 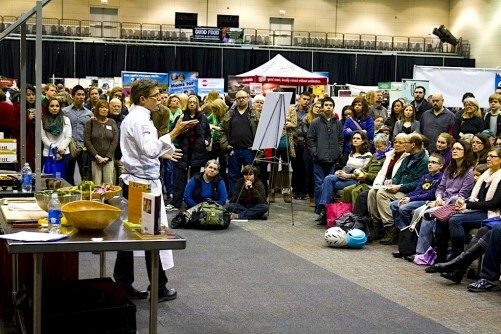 FF: Let’s discuss City Provisions’ influence in helping develop a farm to table sector in Chicago. Friedman: I feel like City Provisions did a lot of things for a lot of people. 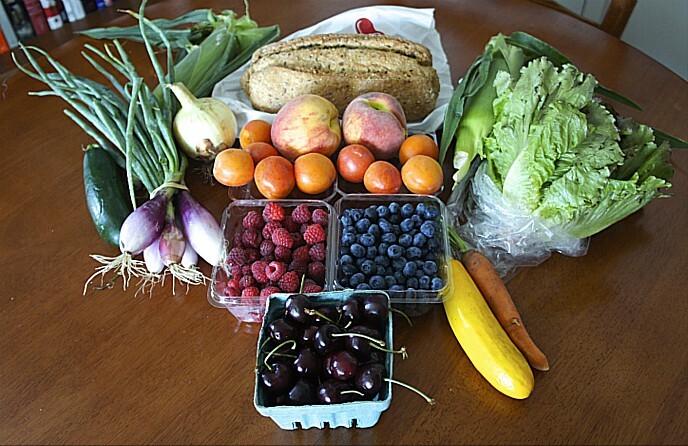 From small producers, a lot of them started with me bringing their stuff in and highlighting it… People still talk about City Provisions to this day, and what it did for Chicago, what it did for the farmers, what it did for producers. That’s awesome. I’m very, very proud of that. There’s no remorse or sense of failure. I feel like it existed in a time for a reason… Was it in the right neighborhood, was it at the right time, it doesn’t matter at this point. It’s gone. But what remains is the impact that it made on people, and that will always stay with me, it will always be a part of me, and it will be a part of a lot of people. FF: One word I hear over and over and over is relationships. You built these relationships and stayed with them. FF: Now you have a whole different challenge. It’s not just one place or restaurant, you have a whole chain of fast-casual restaurants you’re working with. Friedman: At Caffè Baci we have four locations. At each location we do 600-700 covers a day. Our catering is, the numbers are staggering, we probably do more in catering than all of them combined… Caffè Baci’s root location [at 231 S. LaSalle in Chicago’s Financial District] has been around for 24 years… We were the top of the line, the sandwiches, the salads, the pastas. All of a sudden you have Sopraffina, there’s Chipotle, there’s Ben Yehuda, I can throw a rock and hit 25 competitors… even a whiffle ball, I could hit competitors. So we have to be on top of our game always… What’s going to differentiate us from all of these people. All of these people [who work in the Loop] live in the Chicagoland area and they’re going out to dinner. Where are they going? They’re going to Perennial Virant, they’re going to Girl and the Goat, they’re going to Urban Belly, they’re going to all of these places where they expect the chefs to work with local farmers. They’re demanding they know where their food comes from. Yet they come to work and they accept what’s down here. They don’t have to accept anymore. Now they can come to Baci and know where their food is coming from. But we can’t just do it overnight. It’s a lot of work with our vendors, it’s a lot of work with the farmers to set that kind of thing up. It’s not just, “Oh, give me 800 pounds of chicken tomorrow.” They can’t do that, there’s a process to it…. There’s a difference between locally produced and sustainably produced as locally as I can get it, to supply me with the amount of volume that I need. It’s not necessarily about being local, it’s being sustainably produced. I don’t want food that’s pumped with antibiotics or hormones. So now it’s about, people, find me where I can get this volume of this products that fits my parameters, and then start vetting those people and understanding them… If I can go to a Sysco [the leading food distributor to restaurants] and say, “Find me a place where I can source this product that has these parameters, I’m going to move this much of it,” they’ll do it. They got Michigan-farmed turkey for me, because I’m using so much. Why not? Sysco is not the enemy, anymore. 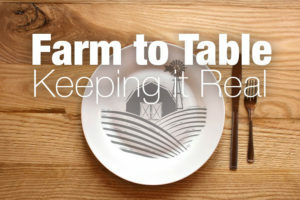 FF: Farm to table 10 years ago became a thing, then it became a trend, and now you talk to chefs like Paul Kahan and they’ll say, we’re past that, it’s a cliché. Friedman: It is a cliché. FF: But you guys pioneered this, built these relationships, helped these farmers grow, scale up, build up supply in this area. Now 10 years later, you’re working in this context, and there’s enough product available. That’s got to be rewarding. Friedman: It is. I can’t tell you it’s not rewarding. But I feel like it’s part of my purpose and it’s what I do. Good, I’m glad, I’m excited, 20 years from now I’ll feel more rewarded about it, but I’m still in it, I’m still fighting for everything… We at Baci as a group are moving in this direction and I feel like at some point it’s going to get lost in translation. I’m almost resigned to be okay with it. Because at the end of the day I go home knowing that I’m still supporting it, I’m still making it. It’s all about making Good Food… That’s what I’m here to do, and that’s what I want to do… Five years from now, I hope everyone in the Loop is doing it. 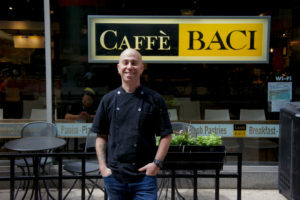 Corrections: Cleetus Friedman’s title at Caffè Baci and the location of the first of the group’s restaurants at 231 S. LaSalle corrected from initial posting. This entry was posted in Chef advocacy, Craft beverages, Farm to table dining, Farm to Table: Keeping It Real, Food Entrepreneurs, Good Food Dining, Good Food restaurant trends, Local Food, Restaurants and Good Food, Sustainable dining and tagged Artifact Coffee, Caffe Baci, Chicago, Chicago Botanic Garden, City Provisions, Cleetus Friedman, FamilyFarmed, Farm dinners, Farm to Table, Farm to Table: Keeping It Real, Fountainhead Chicago, local food, Spike Gjerde, sustainable food, Woodbury Kitchen. Bookmark the permalink.